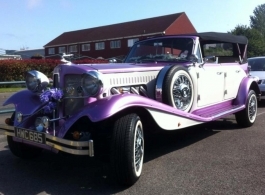 This purpose built Vintage Style Beauford wedding car in stunning Lilac & White offers fantastic photo opportunities. The vintage look combined with a reliable, modern engine makes for the perfect wedding car and it looks equally impressive with the hood up or down. The spacious leather interior is comfortable and classy - a dream car for brides and bridesmaids alike. Chauffeur driven with a choice of coloured ribbons.